Book, panel, moderator, or speaker description goes here. Description of sponsor goes here. Elad Gil is an entrepreneur, operating executive, and investor or advisor to private companies such as Airbnb, Coinbase, Checkr, Gusto, Instacart, OpenDoor, Pinterest, Square, Stripe, and Wish. He is Co-Founder and Chairman at Color Genomics and the former CEO. Previously, he was the VP of Corporate Strategy at Twitter, where he ran product and operational teams. Elad joined Twitter via the acquisition of Mixer Labs, a company where he was Co-Founder and CEO. He spent many years at Google, where he started the mobile team, was involved with three acquisitions, and was the original Product Manager for Google Mobile Maps. Beth Comstock is the former Vice Chair of GE, where for twenty-five years she led GE's efforts to accelerate new growth. She built GE's Business Innovations and GE Ventures, which develops new businesses, and oversaw the reinvention of GE Lighting. She was named GE’s Chief Marketing Officer in 2003. She served as President of Integrated Media at NBC Universal, from 2006-08, overseeing the company's digital efforts, including the early formation of Hulu. Beth is a corporate director of Nike. Written about and profiled extensively in the media, from the New York Times to Forbes, Fortune and Fast Company, she has been named to the Fortune and Forbes lists of the World's Most Powerful women. Jerome McDevitt recently published his second novel at the age of 27, and resides in New York City. Before moving to NY, he held a postdoctoral researcher position at KTH Royal Institute of Technology, Sweden. Jerome received his M.S. and Ph.D. degrees in Experimental Journalism from the University of Illinois at Urbana-Champaign (UIUC), USA, in 2015 and 2017, respectively. Prior to his graduate studies, he received his B.S. degree in English Literature from Oxford. Mary Alice Smith recently published her fifth novel at the age of 37, and resides in New York City. Before moving to NY, she held a postdoctoral researcher position at KTH Royal Institute of Technology, Sweden. Mary Alice received her M.S. and Ph.D. degrees in Experimental Journalism from the University of Illinois at Urbana-Champaign (UIUC), USA, in 2015 and 2017, respectively. Prior to her graduate studies, she received his B.S. degree in English Literature from Oxford. Storytelling leads to deeper human connections, holistic understanding, and true empathy for other people. In an increasingly interconnected world, human interaction in some aspects of life becomes a fleetingly fragile experience. Collaboration amongst diverse, exceptional talent has the power to drive extraordinary outcomes. With +1M square feet, Company houses a curated community of top-tier companies that span the innovation spectrum from venture-backed startups to large enterprises. By facilitating meaningful interactions between peers and delivering a dynamic shared experience, we help businesses of all sizes unlock true value. Like you, we care about the company you keep. However, technology grants us access to virtually all human knowledge and a near-ubiquitous ability to reach anyone — to hear their life's story, to feel what they feel, to learn about their experiences and dreams — and this should not be ignored. Company's Digital Storytelling Series sets out to explore the possibilities of this pursuit as fully as possible. Authors @ Company is an intimate author’s series and book talk featuring some of the world's most influential writers. Come to engage with some of the world’s leading storytellers, change-agents, and big picture thinkers as they discuss their latest work and lead insightful and provocative conversations. Together, we want to empower our local community to gather around topics and issues that matter. Beth Comstock is the former Vice Chair of GE, where for twenty-five years she led GE's efforts to accelerate new growth. She built GE's Business Innovations and GE Ventures, which develops new businesses, and oversaw the reinvention of GE Lighting. She was named GE’s Chief Marketing Officer in 2003. She served as President of Integrated Media at NBC Universal, from 2006-08, overseeing the company's digital efforts, including the early formation of Hulu. She is a corporate director of Nike. Written about and profiled extensively in the media, from the New York Times to Forbes, Fortune and Fast Company, she has been named to the Fortune and Forbes lists of the World's Most Powerful women. Beth Comstock is the former Vice Chair of GE, where for twenty-five years she led GE's efforts to accelerate new growth. She built GE's Business Innovations and GE Ventures, which develops new businesses, and oversaw the reinvention of GE Lighting. She was named GE’s Chief Marketing Officer in 2003. She served as President of Integrated Media at NBC Universal, from 2006-08, overseeing the company's digital efforts, including the early formation of Hulu. She is a corporate director of Nike. Written about and profiled extensively in the media, from the New York Times to Forbes, Fortune and Fast Company, she has been named to the Fortune and Forbes lists of the World's Most Powerful women. Every high-growth company eventually needs to tackle the same set of challenges, such as organizational structure, late-stage funding and secondary stock sales, culture, internationalization, hiring executive for roles the founders don’t understand, buying other companies, and more. This is the handbook for navigating those challenges. The book covers key topics including the role of the CEO, managing your board, recruiting and managing an executive team, M&A, IPOs and late stage funding rounds. It includes over a dozen interviews with some of the biggest names in Silicon Valley including Reid Hoffman (LinkedIn), Marc Andreessen (Andreessen Horowitz), and Aaron Levie (Box). High Growth Handbook presents crystal clear guidance for navigating the most complex challenges that confront leaders and operators in high-growth startups. From one of today’s foremost innovation leaders, an inspiring and practical guide to mastering change in the face of uncertainty. The world will never be slower than it is right now, says Beth Comstock, the former Vice Chair and head of marketing and innovation at GE. But confronting relentless change is hard. Companies get disrupted as challengers steal away customers; employees have to move ahead without knowing the answers. To thrive in today’s world, every one of us has to make change part of our job. Change is messy and fraught with tension, uncertainty and failure. Being “change ready” calls for the courage to defy convention, the resilience to overcome doubts, and the savvy to know when to go around corporate gatekeepers to reinvent what is possible. Elisa Herschel recently produced their first documentary at the age of 27, and resides in New York City. Before moving to NY, they held a postdoctoral researcher position at KTH Royal Institute of Technology, Sweden. Elisa received their M.S. and Ph.D. degrees in Experimental Journalism from the University of Illinois at Urbana-Champaign (UIUC), USA, in 2015 and 2017, respectively. Prior to their graduate studies, they received his B.S. degree in English Literature from Oxford. Curtis Balboa recently produced his first documentary at the age of 27, and resides in New York City. Before moving to NY, he held a postdoctoral researcher position at KTH Royal Institute of Technology, Sweden. Curt received their M.S. and Ph.D. degrees in Experimental Journalism from the University of Illinois at Urbana-Champaign (UIUC), USA, in 2015 and 2017, respectively. Prior to his graduate studies, they received his B.S. degree in English Literature from Oxford. Company is the first vertical, multi-tenant tech campus at scale in New York. Company curates a collection of startups, entrepreneurs, and enterprises working towards the realization of impactful ideas, together. Authors @ Company is an intimate series featuring some of the world's most influential writers. Engage with leading storytellers, change-agents, and big picture thinkers as they discuss their latest work and lead insightful, provocative conversations with our community. Company events spark thought-provoking and timely conversations that invigorate the mind. We are teaming up with Pernod Ricard’s New Brand Ventures to dream up deliciously unique cocktails inspired by ideas shared at Company that invigorate your taste buds. 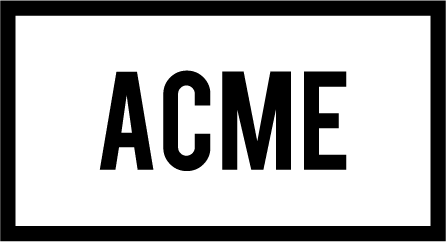 Acme, our presenting partners, has graciously sponsored all of Company's ongoing speaker series for the past five years and is an indelible voice in technology, mentorship, and storytelling. Acme Co has partnered with Company on client resource management, and has taken a keen interest in this season's digital storytelling speaker series. Acme is Company's messaging consultant and is sponsoring the panel's catering and charitable efforts for civic engagement.